J.P Engineering is the company that focuses on the customer as the ultimate goal. J.P Engineering has grown into world class manufacturing & exporting environment, boasting some of the most advanced machinery which includes CNC punched parts , Electric Panel Assemblies available anywhere. By continuous capital investment J.P Engineering demonstrates its commitment of staying on the cutting edge of technology. We are constantly investigating new manufacturing solutions and are always keen to broaden our scope of expertise. In this way we aim to do more than merely pay lip service to our promise that we are a “one-stop job shop”. 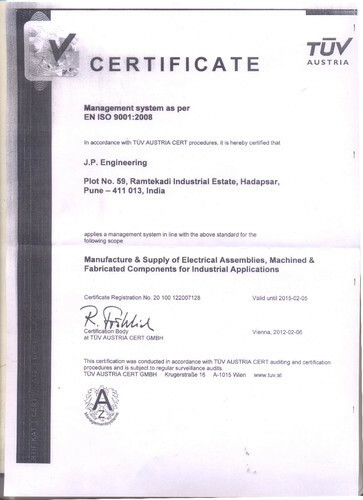 J.P Engineering factory is presently located at Ramtekadi Industrial Estate Hadapsar, Pune. It is fully equipped with various facilities for sheet metal fabrication and assembly of various products. We operate with a team of dedicated engineers, who are specially qualified and highly trained in various disciplines to meet the demanding requirements of the work involved. We aim to deliver whatever we commit to and our commitment to job sets us apart from rest. J.P. Engineering is committed to provide solutions that are tailored to meet the needs and requirement of today’s demanding market. In order to achieve our mission, J.P. Engineering will strive to consistently meet or exceed customer requirement. Be the Industry standard in service to all customers. Maintain a level of integrity with our customers that is unsurpassed by others. Provide working environments where our employees are able to unleash their full potential and thrive in an atmosphere of excellence. Our Sister Concern - SUMEET POWDER COATING PVT. LTD.
Sumeet Powder Coating is a sister concern of J.P. Engineering which caters to all Powder Coating and Spray Painting Needs. Sumeet Powder Coating is well equipped with Seven tank pre-treatment processes for powder coating which is important for increasing the life of the coating. For aluminum components Sumeet has a facility of chromotizing before powder coating. Sumeet has got Phosphating tank with dimensions 3 ft height X 3 ft wide X 8 ft long. Sumeet has two furnaces. Furnace working dimensions are 4.75 ft height X 5 ft wide X 8 ft long and 4 ft height X 4 ft wide X 7 ft long.Powder Coating Thickness achieved is 60-80 microns. All other tests like salt spray, impact etc. are available on customer request. J.P. Engineering has its own programming division formed by a group of knowledgeable and experienced Engineers. As a step towards their achievement this group has come out with a wide range of high quality and reliable products for the customer satisfaction. Programming section is equipped with CAD/CAM as well as machining process equipment like Trutops (punch), Trutops (laser), Auto CAD and more to facilitate and establish the needs of prototyping.